This around the world tour probably wouldn’t be complete without a visit to Prague and that is exactly where we find ourselves today with a view of a couple of Tatra trams. Taken on 27th April 2004 this image shows Tatra cars 8396 and 8397 leaving the Malostranska stop with a route 22 service to Hostivar. The front vehicle retains its original body although the front has been modernised to include a wide destination on the top. 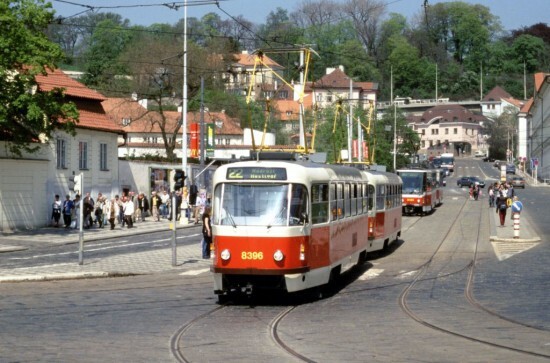 Although there are less Tatras remaining in Prague today they still form a major part of the operating fleet along with modern trams.